Beautiful Townhome on the Grand Marais Harbor. Enjoy relaxing on the ground level patio that leaves you just steps away from the Grand Marais Harbor. Enjoy these views from the patio of Cobblestone Cove Villa 4. This lower level living area offers all the comforts your family needs. This gas fireplace warms you up after a day of skiing or hiking. Watch your favorite TV program on this flat screen. Relax on the plush, comfortable furniture in the living room. Step out of the sliding glass doors onto your private Lake Superior-facing patio. Enough room for everyone in this lower level dining area. You have all the appliances that you need to make homemade meals. Seating for two at the counter. Dining area provides room for 4 more people. Half bathroom located on the main level off of the dining area. This master bedroom offers a private balcony , gas fireplace, t.v. and queen bed. This stone gas fireplace warms up the night after a cool day of kayaking . Wake up in this master bedroom facing the beauty of Lake Superior. Master bedroom has a private bathroom that features a shower/tub combo. Guest bedroom offers a queen bed and its own bathroom. Plenty of space to unpack your belongings. Bathroom off of the guest bedroom also features a shower/tub combo. Or step out onto the master bedroom balcony for even more incredible views. Sit back and enjoy the Grand Marais Harbor and Trading Post views. Tall trees give you privacy without taking away from the view. 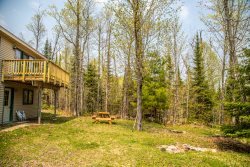 Enjoy easy access to the lake and walking distance to many businesses and activities in Grand Marais` downtown area at Cobblestone Cove Villa 4. Cobblestone Cove Villa 4 is a modern 2 bedroom, 2 bathroom townhome located in the heart of Grand Marais, MN. This beautiful villa features a ground level patio and a balcony off of the master bedroom, which both take advantage of the incredible Lake Superior views. This Grand Marais vacation townhome at Cobblestone Cove is the premier waterfront destination on the North Shore. When you stay with us, you'll enjoy the scenic beauty and many moods of Lake Superior. You'll also be within easy walking distance of everything to see and do in Grand Marais. Beautifully designed and appointed, these lakeside vacation homes boast full kitchens, 2 gas fireplaces, private decks overlooking Lake Superior, vaulted ceilings, and breathtaking views of Boulder Park, The Grand Marais Harbor and Artist's Point. The Cobblestone Cove Villas were built in 2005 on one of the most spectacular pieces of land in Grand Marais. The 4-unit complex is on the shoreline of Lake Superior. Some owners choose to use their units for their own private vacations to the North Shore. Others rent out units for you to enjoy. Even though this unit's structure is the same as the other nine, this one is unique for it's vintage decoration. My husband and I have stayed at Cobblestone Cove 4-5 times. We will keep coming back because we love it so much......the condo, the view, and, of course Grand Marais itself. The minute we walk into the condo, it feels like a home....so welcoming. This time our children and their partners came also--all for the first time. They were also taken with everything Cobblestone has to offer. Cobblestone Cove was wonderful. Great location, clean townhouse. Really enjoyed the property. The location right on the harbor was outstanding and had a fantastic view of the lake. The great staff is key--and it is one of the most powerful reasons we recommend you to our friends... The crew is thoughtful, competent, and enjoyable to work with. This year's stay involved the problem-solving re location, and was handled very well, and Thank You All! You may use our comments, but we do not want to be identified by name. We enjoyed the stay at Cobblestone 4--though it was a surprise as we'd reserved the Governor's Cabin--which was undergoing an unfortunatate plumbing crisis. From cabin to luxury condo was a change that really is quite a switch! It was an outstanding replacement. We especially enjoyed being in the middle of town, right near the co-op (& its great coffee)...plus it was fun being right on the water. The location was perfect! It is walking distance to shops and restaurants. Waking up to the view of Lake Superior was delightful to all senses. I have nothing bad to say about this experience. We will be back! The location is excellent.....easy walk to everything. Cobblestone Cove #4 is beautiful, very well appointed and very well cared for! The views were magnificent and the boys loved playing in the loft area. We definitely want to come back!